Ryder & Wilcox has extensive experience in the preparation of Site Plans for residential, commercial and municipal projects. We are well versed in local zoning ordinances and permitting procedures including Conservation Commissions, Board of Health, Planning Boards, Zoning Boards of Appeals, Massachusetts Endangered Species Act (MESA), and Chapter 91 applications. Ryder & Wilcox has broad experience in the permitting processes that are regulated by the Massachusetts Wetlands Protection Act and local Wetland Protection Bylaws. Ryder & Wilcox has considerable experience in the design and permitting of Innovative/Alternative (“I/A”) systems as approved by the Massachusetts Department of Environmental Protection (DEP). “I/A” systems are often required to remediate failed systems in environmentally sensitive areas, or to allow increased density for new construction. Catch basins and leaching pits are often necessary to contain rainwater from hardened surfaces such as parking lots, driveways and roads. Ryder & Wilcox can provide engineering plans for new road and parking lots including storm drainage system design, grading and landscaping details. 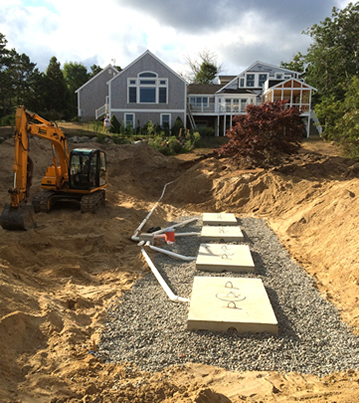 Soil evaluation is one of the requirements of designing a new sewage disposal system. Test holes are dug in the location of the leaching facility and a percolation test is performed. The results of the soil evaluation are submitted to the property owner and the town Health Department. An inspection must be performed by a State approved inspector and is valid for 2 years. A report must be completed and filed with the local Health Department. In addition, many Health Departments have their own forms to complete as well as fees for reviewing the reports.